Anna Maria Ferrante (6) had a goal and an assist. 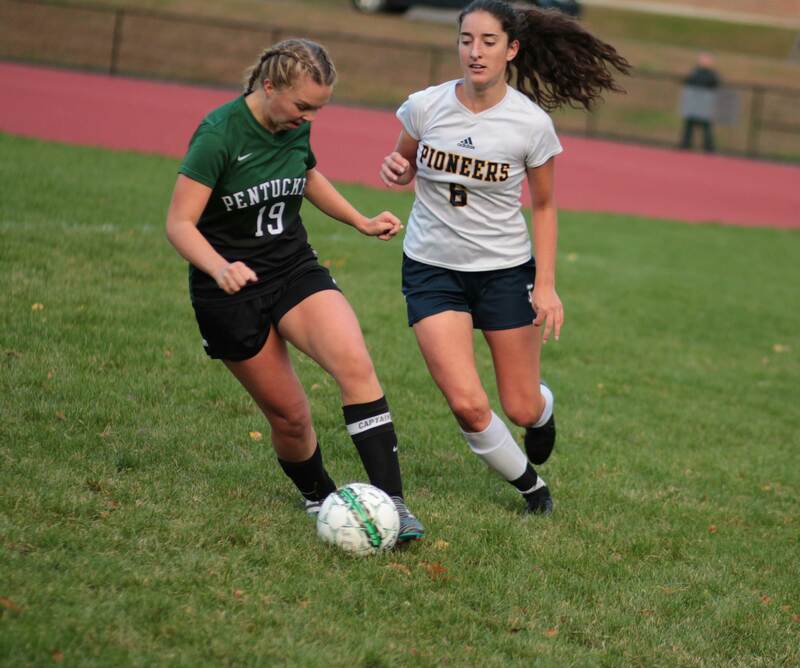 (West Newbury MA) Pentucket needed a win to qualify for a berth in the post-season. And the Sachems are still looking for that important W after falling to Lynnfield, 2-0, on cloudy, rainy Wednesday afternoon of Cape Ann League action. 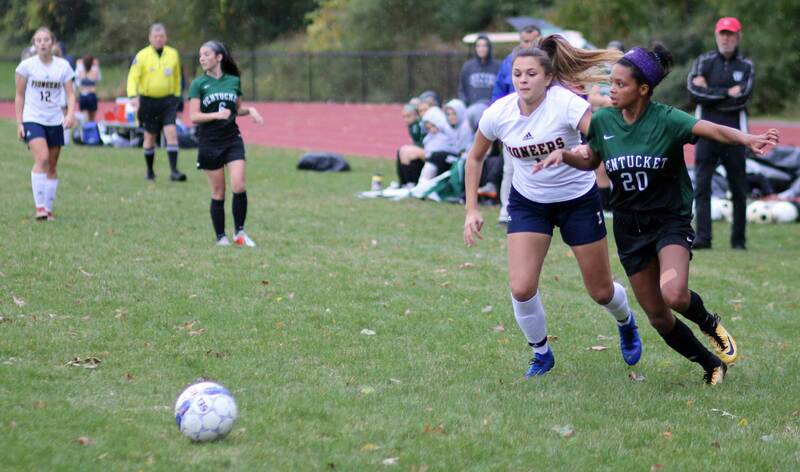 The Pioneers (11-2-2) scored twice during a 12-minute segment in the first half. 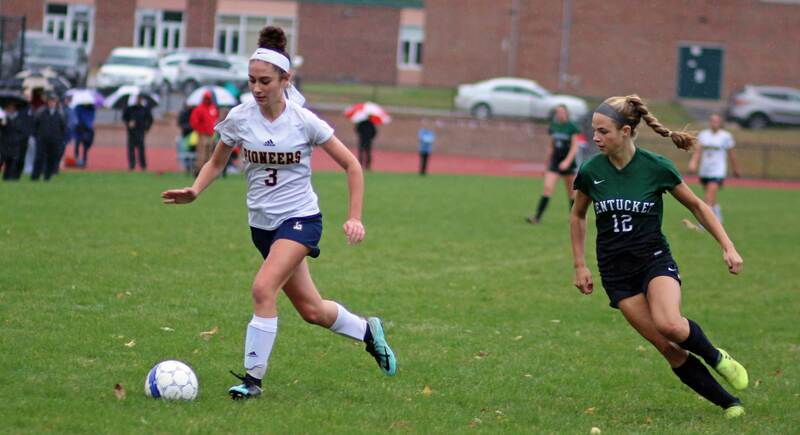 Junior Anna Maria Ferrante tallied one goal for the visitors and assisted on the other. 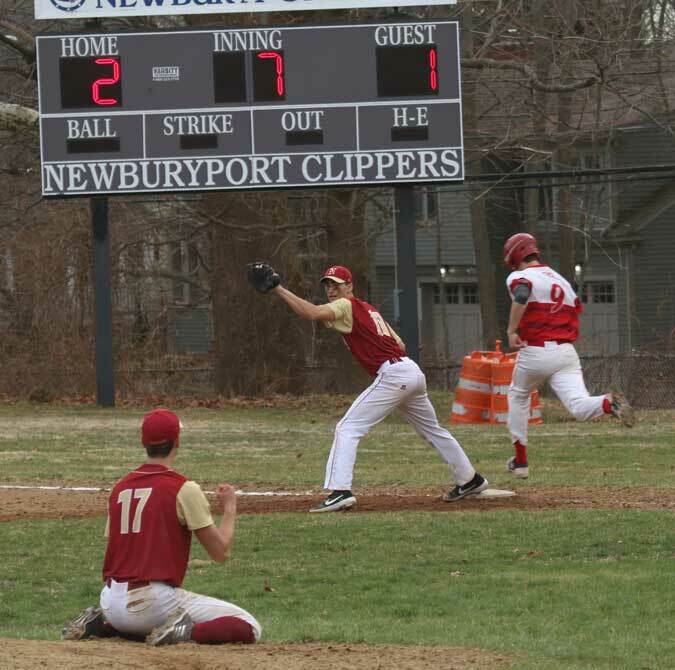 Three weeks ago, the two teams played to a 2-2 tie at Lynnfield. 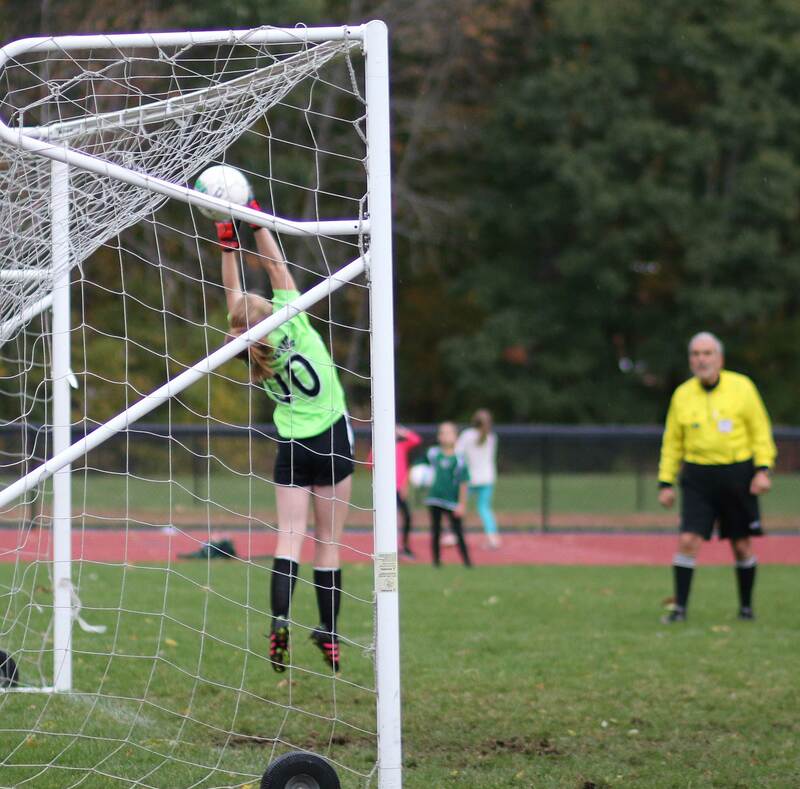 The Sachems (7-5-3) came back to get the tie in that one and hit the crossbar on their last shot of the game. But that was then and this time around the home team was missing key players and there was also the excitement of it being Senior Night. 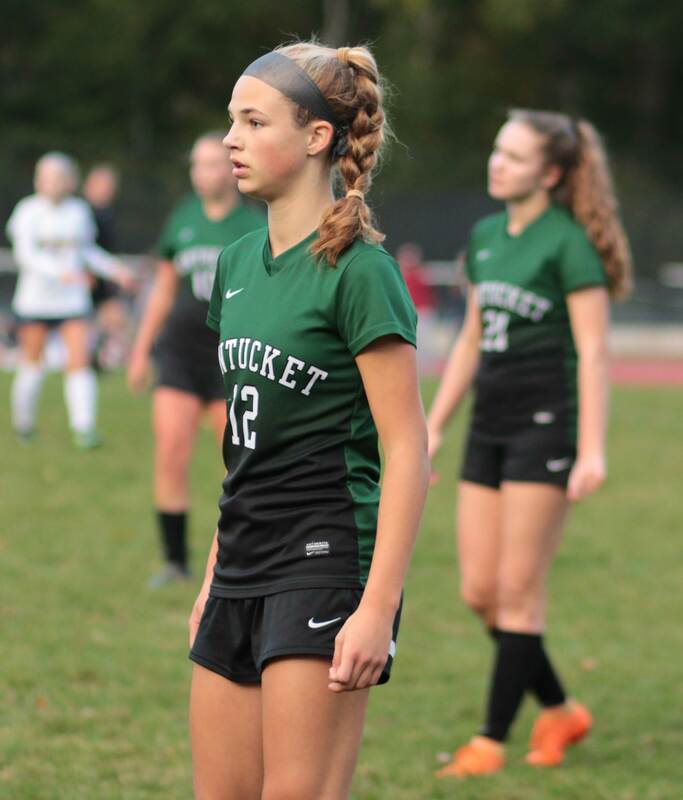 Pentucket’s three injured players include two of their top three scorers (Jacey Jennings and Annabelle Sylvanowicz) as well as senior goalie Vanessa Franco. In the first half, Lynnfield’s Anna Maria Ferrante kicked a rebound over the net at the 23-minute mark. 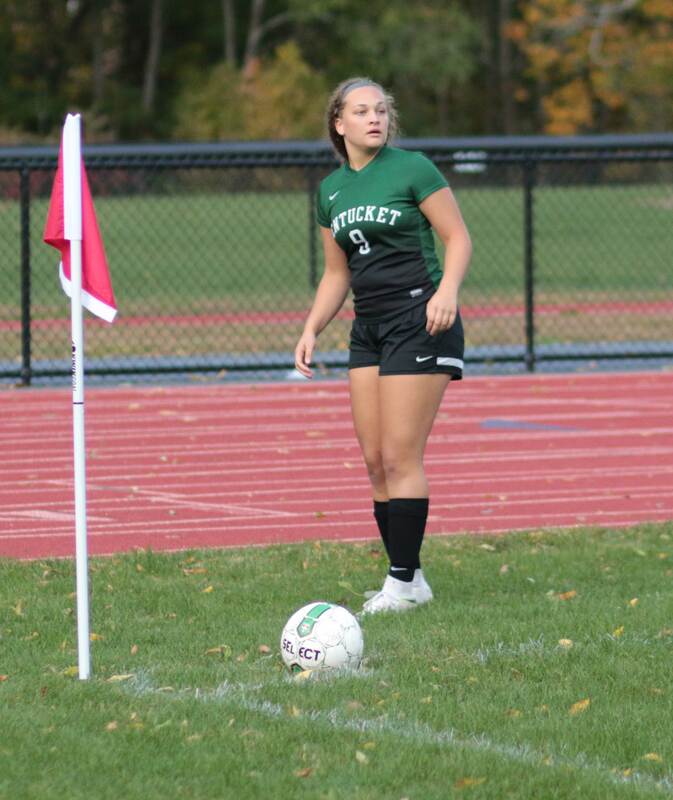 A minute later she lined up a free kick from the right because of a foul on Pentucket’s Riley Roche. 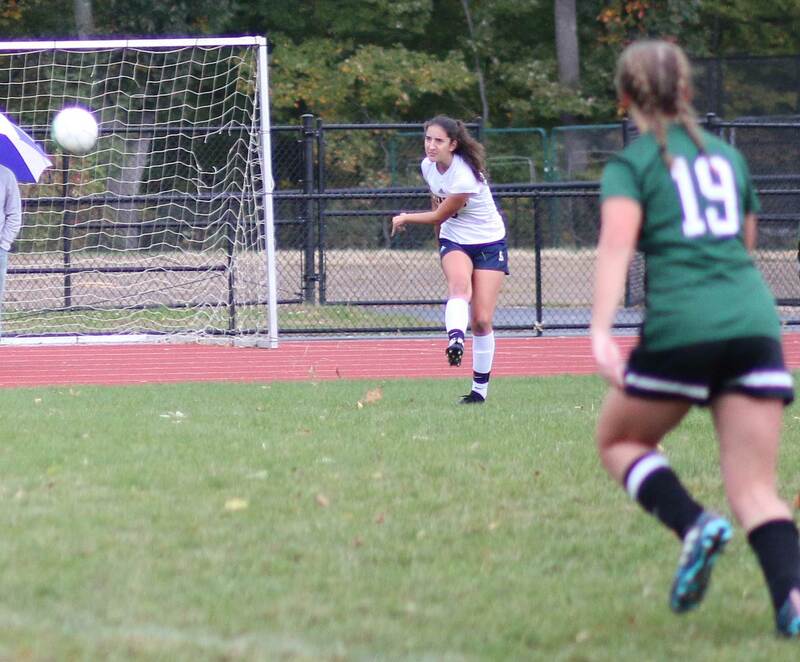 Anna Maria’s free kick was high on keeper Sophia Heusser (JV call-up) and sailed in off her finger tips. 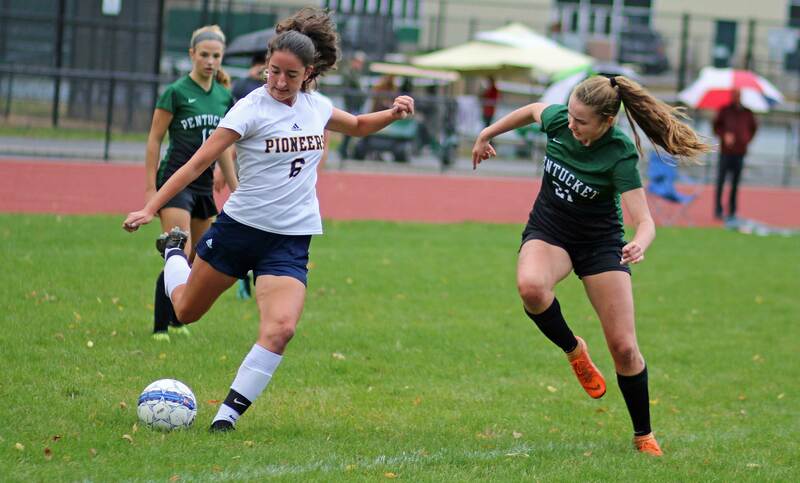 The Pioneers gained further separation from Pentucket with a second goal twelve minutes later. 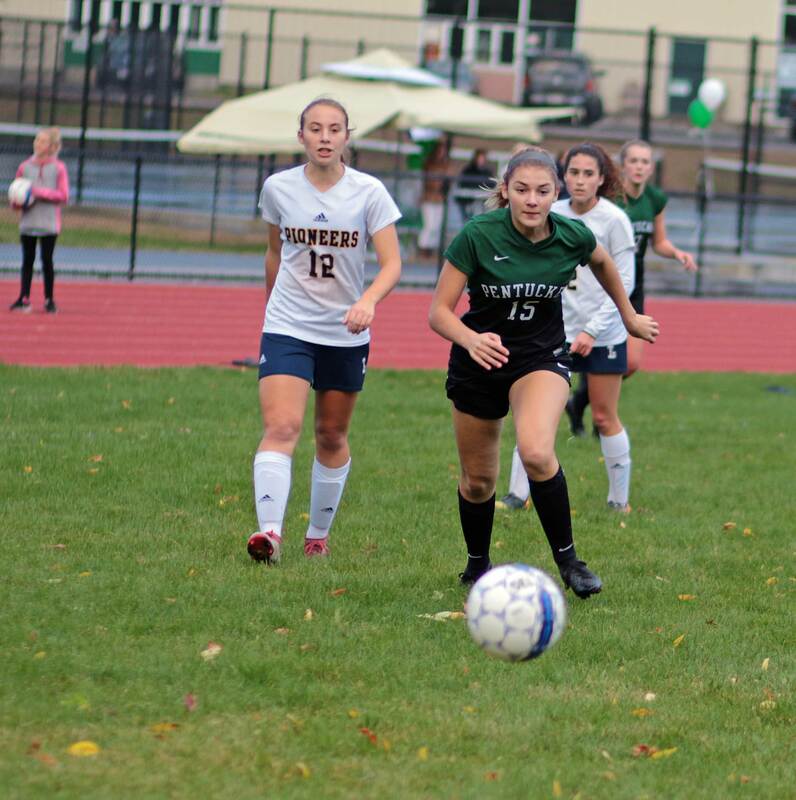 Emma Montanile dribbled in and cashed a wide-open look. “It was set up by a nice give-and-go and a good finish by our senior,” explained Coach Vermont. 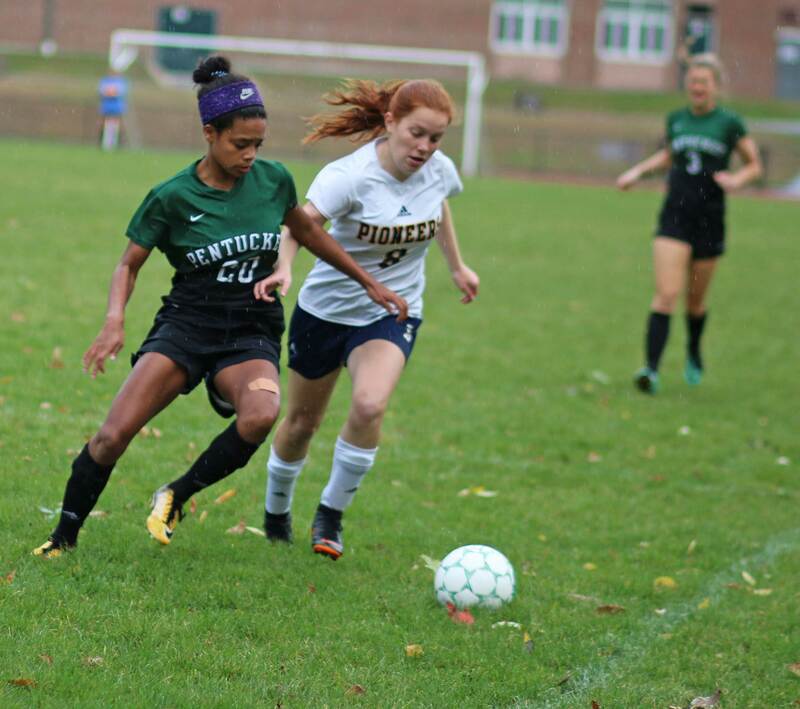 Pentucket’s Syiera Campbell impressed me with her speed and persistence. Seven seniors were honored before the game…….actually eight, including Emma Montanile of Lynnfield. I was unaware of a rain forecast. Fortunately I had an umbrella in my car that I used to protect my camera. The Sachems have three games left. The Pioneers are 9-0-2 against Pentucket since 2011. 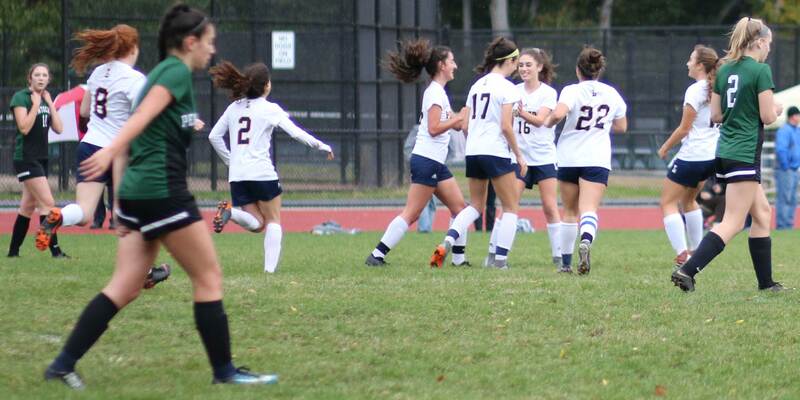 Lynnfield is unbeaten in their last six games. 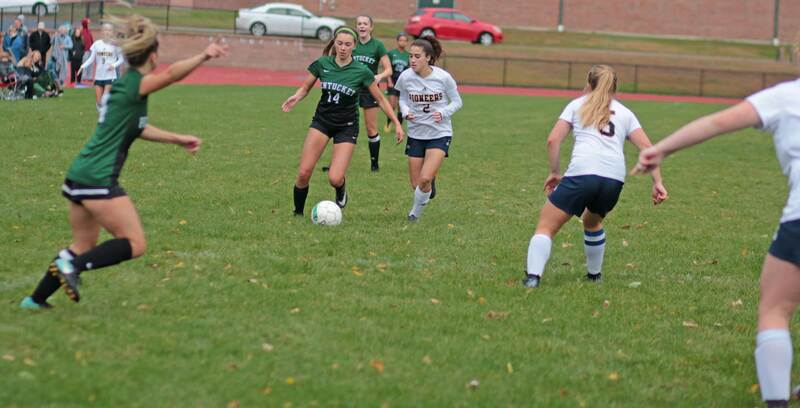 Senior Tia Zanardi and sophomore Jacey Jennings were Cape Ann League All-Stars last season.